MANCHESTER, England – A group of psychiatric care centers run by a Catholic religious order in Belgium has announced it will permit doctors to undertake the euthanasia of “nonterminal” mentally ill patients on its premises. In a nine-page document, the Brothers of Charity Group stated that it would allow doctors to perform euthanasia in any of its 15 centers, which provide care to more than 5,000 patients a year, subject to carefully stipulated criteria. Brother Rene Stockman, the superior general, has distanced himself from the decision of the group’s largely lay board of directors, however, and has told Belgian media that the policy was a tragedy. “We cannot accept that euthanasia is carried out within the walls of our institutions,” said Brother Stockman, a specialist in psychiatric care, in an April 27 interview with De Morgen newspaper in Brussels. He told the newspaper that he intended to raise the matter with Catholic authorities in Rome and with the Belgian bishops. Carine Brochier, a Catholic bioethicist from Brussels, told Catholic News Service in a May 3 telephone interview she was certain that political and financial pressure was exerted on the Brothers of Charity Group to allow euthanasia. 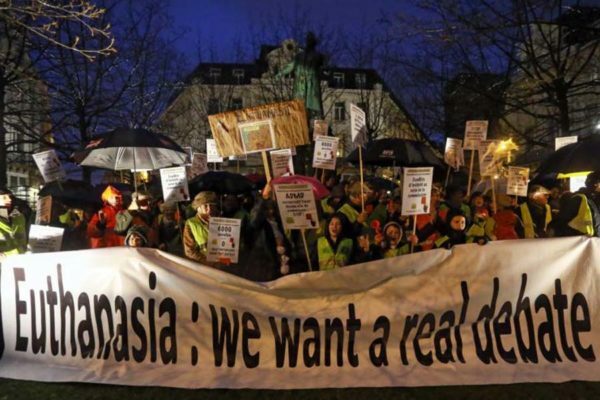 The group’s new policy document, which was drafted in March, comes about a year after a court fined the St. Augustine Catholic rest home in Diest, Belgium, for refusing to allow the euthanasia of a lung cancer patient on its premises. “The pro-euthanasia movement is really happy about what is happening,” said Brochier, adding that she believed internal pressures also influenced the decision. “The Brothers of Charity work with laypeople. Those people think that euthanasia should be allowed in the premises,” she said. “Also, I guess some of the Brothers of Charity wanted the euthanasia to be permitted within the walls. “Rene Stockman is completely the opposite way, but the Brothers of Charity here in Belgium are very, very progressive,” she said. The suffering of psychiatric patients must therefore be considered hopeless, unbearable and untreatable if a request for euthanasia was to proceed, the policy document says, adding that requests must be voluntarily and repeatedly made by a competent adult for them to be legitimate. After three doctors have assented to the patient’s request, the euthanasia can go ahead on the Brothers of Charity premises, the document concluded. In the Flanders region of Belgium, the order is considered to be the most important provider of mental health care services. The order also runs schools, employing about 12,000 staff nationwide. Raf De Rycke, chairman of the board of the Brothers of Charity Group, said in comments reported by De Morgen April 25 that the group was guided by three fundamental values in producing the policy: respect for the patient’s life, the autonomy of the patient and the relationship between the care provider and the patient. Brochier said she suspected the Belgian bishops were “very embarrassed” by the policy but suggested they shared some of the blame because, she said, they appeared to give up the fight against euthanasia, partly by failing to correct some priests and doctors when they have argued for the procedure while publicly purporting to be Catholic. “Palliative care is very good in Belgium. We don’t need euthanasia,” she added. CNS repeatedly try to reach the Belgian bishops’ conference for comment. Technically, euthanasia in Belgium remains an offense, with the law protecting doctors from prosecution only if they abide by carefully set criteria. Despite safeguards, critics have argued the law is interpreted so liberally that euthanasia is available on demand, with doctors also increasingly giving lethal injections to people who are disabled, demented or mentally ill.